It started perfectly as Jack took advantage of a strong tailwind throughout the 100m heats to run a personal best of 11.17 (+3.4) in the fourth heat, taking 823 points. Next was long jump Turner leapt 6.99m (+4.0) another personal best in the final round to earn 811 points, Those tallies combined with the 100m left him in 6th on 1634 points. In the final event of the first session he returned to the field for the shot put (5kg). Turner once again produced a lifetime best, this time an effort of 13.05m, which was a remarkable improvement by 48cm. This moved him to tenth position after three events on 2304 points, 134 points off the podium places at the moment. 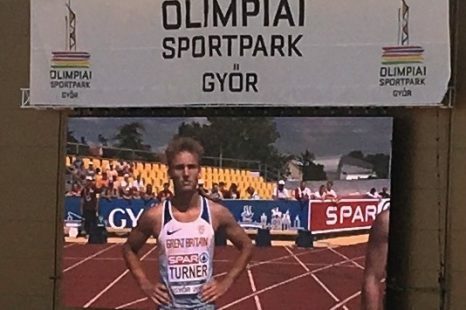 Turner started his 2nd day with his fifth personal best out of six, clocking a 14.07 over the 110m hurdles (91cm) which moved him up to fifth in the overall standings, just 125 points outside the bronze medal position..
During the pole vault his least favourite event , Turner achieved his sixth personal best out of eight events, clearing 3.70m under pressure on his third and final attempt. Later in the javelin (500g), Turner earned another career best of 52.22m, pulling it out of the bag in the opening round.